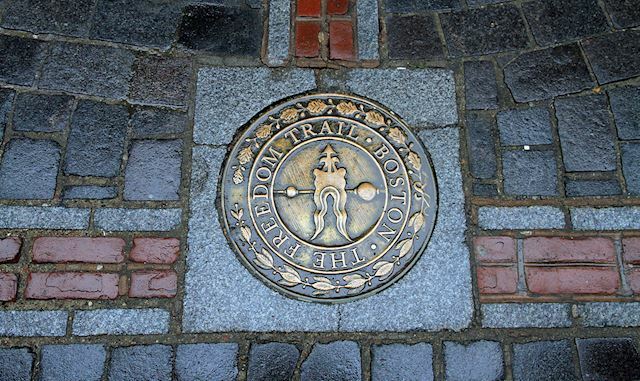 •Beacon Hill (24 Beacon St., Boston, Park Street MBTA Stop): The Beacon Hill stretch of the Freedom Trail is also the beginning of the path. Not to be missed, it is your best chance to go off the course and explore the iconic architecture, gas-lit streets, and charming restaurants and shopping of Beacon Hill. The gold dome of the Massachusetts State House is an easy-to-find landmark for this swath of history. •Guided Tours (139 Tremont St., Boston, Park Street MBTA Stop): The Freedom Trail visitor center at the start of the trail is a great place to get maps to lead you along the way. For those looking for a bit more character to their visit, check in with the attendants about a guided tour. These are led by in-character guides, giving guests authentic colonial flare while learning about Boston’s storied past. •Faneuil Hall (4 South Market St., Boston, Government Center/State/Aquarium MBTA Stops): The Cradle of Liberty is one of America’s top tourist attractions, and it is under a renovation to make it more appealing to visitors and locals alike. This stretch of the Freedom Trail is home to the National Park Service visitors center as well as plenty of dining, drinking, and shopping destinations to take a break from your stroll. Head to the Boston Public Market two blocks away for an even more authentic taste of Beantown. •Revere House (19 North Square, Boston, Haymarket MBTA Station): The grey, wooden home on this quiet, cobblestone square was the home of midnight rider Paul Revere at the time of the American Revolution. Built around 1680, it is the oldest building in downtown Boston. The Revere House became one of the first historic home museums when it opened its doors to the public in 1908. Exhibits range from the Midnight Ride to Revere’s work both before and after the Revolution. •Charlestown (Monument Square, Charlestown, Community College MBTA Stop): The end of the Freedom Trail affords visitors some of the best views in the city. Visit Old Ironsides (aka the USS Constitution) in the Navy Yard to see the oldest ship in the Navy and learn how she kept the Brits at bay during the War of 1812. Afterward, head to Monument Square to the Bunker Hill Monument, which reflects on the Revolutionary battle but also gives those who climb to the top an incredible view of the Boston skyline.